Storyteller and author Anna Conomos has spent over thirteen years performing internationally in festivals, museums, schools, castles, boats and beyond! 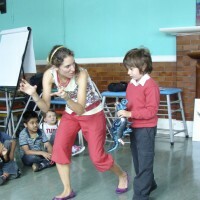 In 2005 Anna won the Young Storyteller of the Year UK award. With her boundless energy and vocal colour, Anna’s spell-binding collection of folk and fairy tales, myths, legends and songs from across the globe will sweep you up into a whirlwind of adventure. Whether young or old be prepared to get involved – turn into crazy characters, learn interactive rhythms, journey through time and space. This is a storytelling experience not to be missed! “I love Anna’s powerful, crisp style of storytelling and especially the way she includes heart-wrenching emotional songs and music. She performed her dramatic, dark Creation Story at Windsor Castle for leaders from nine of the world’s major faiths.” – Martin Palmer, BBC Presenter and Secretary General of ARC. “Brilliant work, storytelling has been such a hit and a great way to bring alive the space. I adore Anna’s stories!” – Annalice Creighton, Programmes Coordinator, Australian National Maritime Museum. 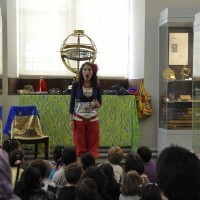 “Anna is excellent both as a performance storyteller and as someone who can teach others storytelling techniques in an enjoyable, engaging and informative way.” – Jennifer Thomson, Community History Curator, Walsall Museum. Storytelling brings the curriculum to life in schools providing both an educational, entertaining and memorable experience for pupils (and also teachers) of all ages! Unique and tailor-made performances designed to animate museum and gallery artifacts and displays. 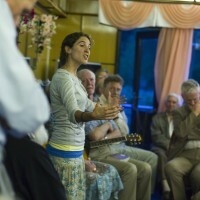 Alongside her shows, Anna provides workshops and training for members of staff. Contemporary and traditional stories from all corners of the globe designed to creatively engage and inspire participants at conferences, festivals and events of any kind.